The Gates is a site-specific work of art by Christo and Jeanne-Claude. The artists installed 7,503 vinyl “gates” along 23 miles (37 km) of pathways in Central Park in New York City. 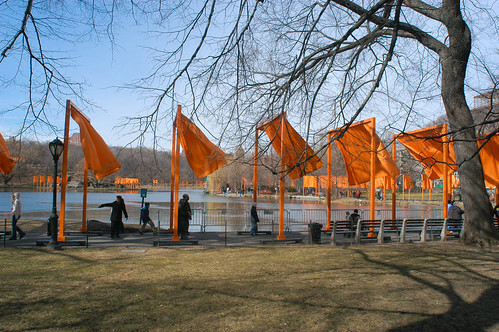 From each gate hung a panel of deep saffron-colored nylon fabric. The exhibit ran from February 12, 2005 through February 27, 2005. The Gates were greeted with mixed reactions. Some people loved them for brightening the bleak winter landscape; others hated them, accusing them of defacing the landscape. Some cyclists saw them as an obstruction which could cause accidents, although cycling is not legal on those paths. They received a great deal of their nationwide fame as a frequent object of ridicule by David Letterman as well as Keith Olbermann, whose apartment was nearby. (notes courtesy of Wikipedia). Going through my old photos, I found this and some other shots of our 3 trips to Taveuni in Fiji. Its about a 90 minute flight on a small plane form the international entry point of Nadi (pronounced NAN-dee). One of the most beautiful places I have been on my travels over 6 continents and 55 countries. Its the Kauai of Fiji, boasting beautiful waterfalls, beaches and spectacular diving in the Somosomo straits. 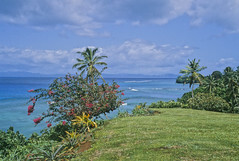 We stayed all visits at Dive Taveuni, owned by New Zealanders Rick and Do Cammick. They sold it a while back and returned to NZ after almost 20 years there. A great vacation retreat and if you enjoy diving, a treasure! Camera phones may soon offer more megapixels than some DSLR cameras. Imaging company OmniVision announced today that they have developed a 14.6-megapixel image sensor that will fit in cell phones. These sensors are capable of both high-resolution still photography and 1080p high-definition video recording. I wonder how long it will be before camera phone imaging quality rivals the quality of the best point-and-shoot cameras.